The event will start with a community block party at 4:30 p.m. at the Mayo Civic Center Plaza. The block party will include music, food and interactive activities. The block party requires no ticket and is open to anyone in the community who would like to attend. Public tickets for the event will be made available starting August 27 at the Mayo Civic Center Box office. Tickets are free of charge, with a limit of two per person. The Mayo Civic Center is located at 30 Civic Center Drive SE, Rochester, MN 55904. The Box Office is open Monday – Friday, 10 a.m. to 5:30 p.m.; Saturday 10 a.m. to 2 p.m. and is closed on Sundays. PBS announced today that it will air "THE MAYO CLINIC: FAITH - HOPE - SCIENCE," a new documentary executive produced by Ken Burns, Tues., Sept. 25, 2018, 9 p.m. EDT, on PBS. A repeat broadcast will air on Weds., Sept. 26, 10 p.m. EDT. The two-hour documentary explores Mayo's 150-year history highlighting the primary value of putting the needs of the patient first. 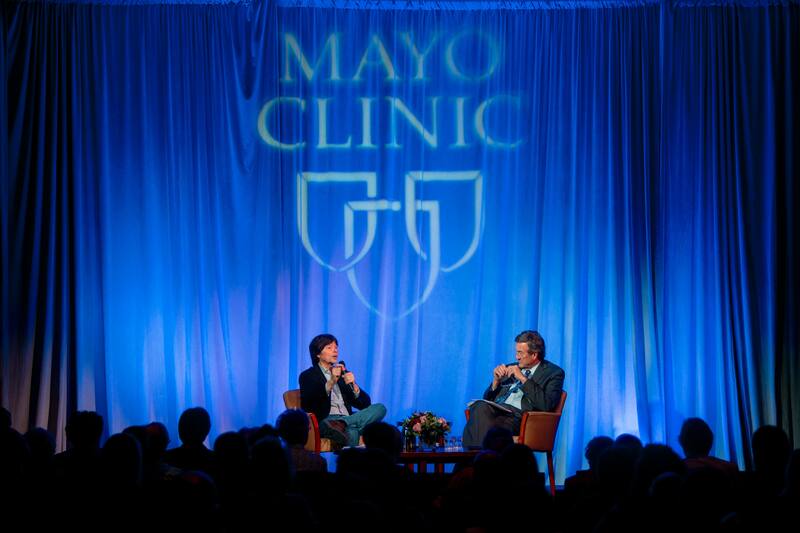 Ken Burns and Dr. John Noseworthy discuss "THE MAYO CLINIC: FAITH - HOPE - SCIENCE" documentary during a private Mayo Clinic staff event. “We’re honored that acclaimed filmmaker Ken Burns’s genuine passion for history and his curiosity of our medical heritage sparked interest in producing a documentary about Mayo Clinic. He and his associates have undertaken the extraordinary challenge of telling our 150-year story, chronicling the rich history and pioneering contributions of our founders to our work with seriously ill patients today. The captivating stories of our patients come alive on film as they share intimate details about their search for hope and healing. This hope emanates from our staff, who work tirelessly every day to live our patient-centered values. "THE MAYO CLINIC: FAITH - HOPE - SCIENCE" film was executive produced by Ken Burns. Directed by Ken Burns, Erik Ewers, Christopher Loren Ewers. Produced by Julie Coffman, and written by David Blistein. More details about the film can be found on the PBS PressRoom.